Our eighth post in a series counting down the 10 most influential books I’ve read this year – 2011. 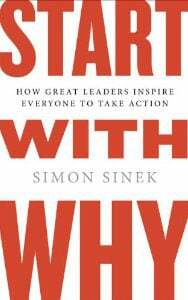 Simon Sinek, Start With Why, Portfolio by Penguin, London, 2009. This book is like Atul Gawande’s Checklist Manifesto – simple and profound. I’m a sucker for this! Give me a simple idea that has depth, breadth and substance and I’m totally interested. Sinek is saying: Start With Why (you probably guessed that bit! ), then How and then What. The order is important! I was attracted to this book because ‘Why’ is the basis of manifestos and I’m writing my own book about that right now. I was also sceptical. If the book title summed up the book, then I didn’t really need to read it, did I? Then I saw the TED video of Simon Sinek explaining his book. And, I realised there’s more substance here than I had previously thought! This idea can explain a lot of useful things about life and business. Personally, ‘Why’ gives you motivation and meaning for ‘How’ and ‘What’ you do. That’s important! In business it addresses the central goal of every single business! We discussed this in an Ideas Marketing / Book Rapper webinar derived from this book called: How to Inspire Your Customers to Buy. You can see the slides here. Plus it covers how to be a great leader and inspire others. That’s a good list: motivate yourself, lead others and inspire your customers. And, for these three reasons this book makes my Top Ten List of Most Influential Books for 2011. Read it if one or all of these three things are important to you. One of MY highlights of 2011 was getting to see Simon give his talk, live! Even though I saw his Ted talk, my expectations were exceeded by his charm, ease, and the follow up Q & A. He’s a MUST SEE. Yep, there’s something to be said for live – particularly if the presenter is good! Thanks Kellie!